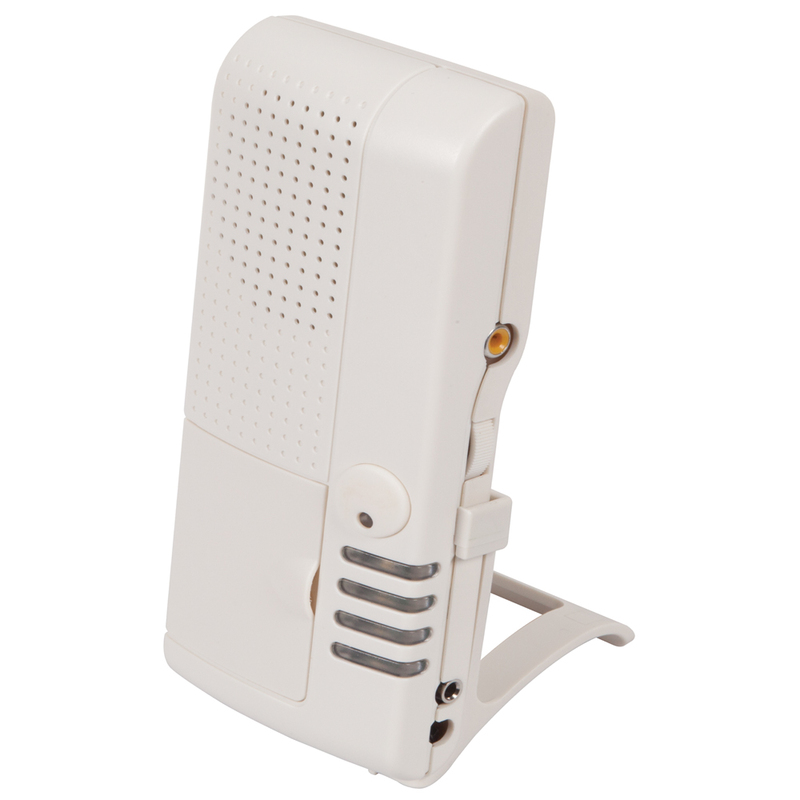 The STI-V34014 is a 4-channel wireless receiver that can connect up to 4 wireless STI devices to alert the user when an event occurs. When the unique voice receiver detects a tripped site, it sounds programmable voice messages to alert which transmitter has been activated. The receiver offers ten tones/tunes and 53 selectable words (available in English or Spanish). The selectable words can be programmed simultaneously in sets of up to four to create a custom message (i.e. Emergency Exit Side Door, or Emergency Side Door Exit, or Side Door Emergency Exit, Exit Side Door Emergency, etc.). The STI-V34104 can monitor up to 4 different STI transmitting devices at a single, convenient location. It operates up to 1000' (line of sight) and is supervised for low battery and connection. There are four LED zone indicators and each have the selection of latching or momentary. Includes 12 Volt DC power supply and can be mounted on a wall or table. Also includes easy voice prompts for programming. The receiver can monitor devices such as: front/side/back doors, gates, windows, driveways, mailboxes, cabinets, safes, extinguishers, docks, pools, sheds, garages, decks, patios, halls, barns, medicine/gun/liquor cabinets, push buttons, etc. Receiver sounds selected voice messages when monitored site is tripped. Easy programming voice prompt. Receiver recognizes transmitter. Monitor four different sites from one convenient location. Offers ten tones/tunes and 53 selectable words (available in English and Spanish). Selectable words can be programmed simultaneously in sets of up to four to create custom message. Operates up to 1000' (line of sight). Supervised for low battery and signal reception. Audible chime tone and 12 volt 75 MA output. Has four LED zone indicators and each have the selection of latching or momentary. Includes 12 Volt DC power supply. Can be mounted on a wall or table. Copyright TC Wireless. All Rights Reserved.